Could Taylor Cornelius be a late-round draft pick? The NFL Draft is just a couple of weeks away so let’s take a look at a few of OSU’s draft-eligible departures, where they are projected to land and how they are viewed nationally as prospects. Last month, the Tulsa World‘s Guerin Emig spoke with ESPN draft guru Mel Kiper Jr. about a slew of in-state draft prospects and, predictably, OSU’s leading rusher came up. “He showed explosiveness at Oklahoma State with the pads on,” Kiper said. “He’s 5-9, under 200 pounds. But with a 4.4 (40-yard dash) with a 40-inch vertical, he gives you the kind of explosiveness that people want. In Kiper’s latest three-round mock, he has Justice going to the Ravens with the No. 102 overall pick. Chris Trapasso of CBS Sports recently took at look at this year’s crop of running backs and made pro comparisons for each, and he likened Justice to the former Heisman* winner. Not bad company to keep. The visits are not exactly public knowledge but in the world we live in (in my best Gundy impersonation), it’s hard to keep many things secret, especially during #DraftSZN. Bleeding Green Nation, an Eagles fan blog, originally reported that Justice Hill “seemingly” met with the Philadelphia Eagles on Wednesday based upon the all-Big 12 rusher’s one Instagram story. But that visit was later confirmed by multiple media outlets. 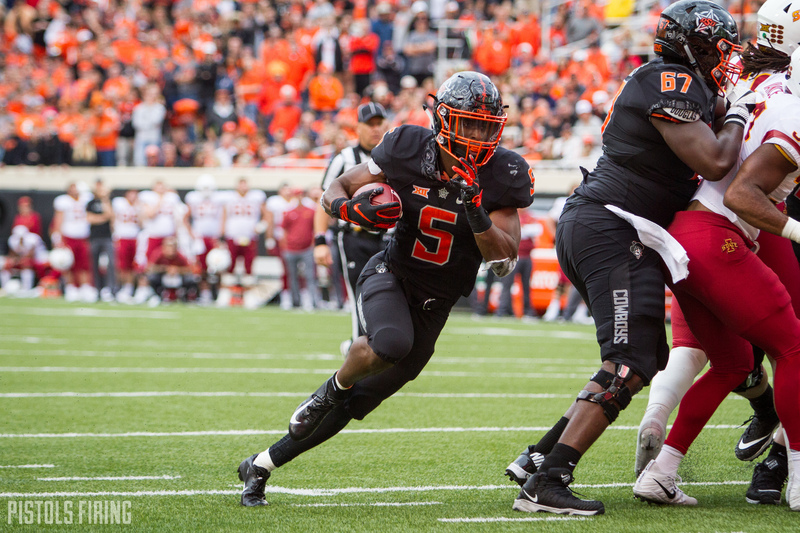 RB Justice Hill (Oklahoma State) is in Philly, taking an #Eagles visit. Possible Day 3 target at running back. Philadelphia would provide an interesting landing spot for Justice because I think he would fit well with the offense the Eagles run. They did just trade for Jordan Howard from Chicago and have a slew of backs on the roster, but it appears they may still be looking to add depth to their backfield via the draft. Justice could provide a value pickup for the Philly if he were still available at either fourth round pick (127 or 138). According to NFL insider Ian Rapoport, Brailford met with the Steelers earlier this month. Draft workouts and visits: #NotreDame CB Julian Love is working out for #Saints today, while #Florida OT Jawaan Taylor is working out for #Falcons. … #Arkansas pass-rusher Randy Ramsey is visiting the #Packers. … #OKState edge Jordan Brailford visited the #Steelers yesterday. It’s possible that Brailford makes it a trio of former Cowboys at Pittsburgh. The projected mid- to late-round pick could add value to a young, rebuilding Steelers defense. One-year starter Taylor Cornelius was bound to get at least some pub this close to the draft. At 6-6 and 230 pounds, his measurables are enticing, but his stats demand a second look by draft evaluators and hopeful NFL fans alike. SB Nation site Cincy Jungle listed Cornelius as a sleeper draft pick for the Bengals. The post did point out his sub-60 percent completion percentage and bemoaned OSU’s “non-NFL” system, but gawked at his impressive numbers. It’s possible that a team takes a flyer on Cornelius with a late round pick based solely on his upside. It’s more likely that he gets picked up as an undrafted free agent, but he would get a chance to prove himself during some team’s training camp.